Update: KEZI’s Susan Gager has a story on pay and the union effort, with a brief interview with Prof Dan Pope. 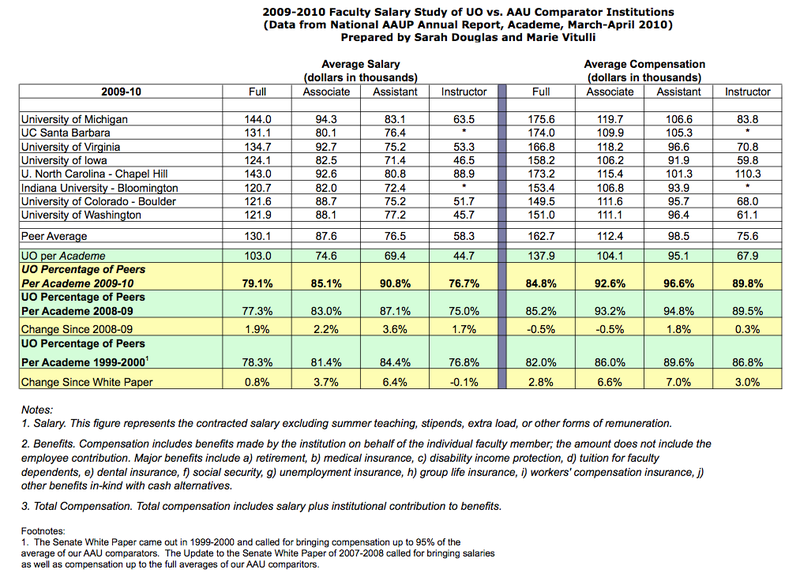 5/3/2011: Professors Sarah Douglas and Marie Vitulli have prepared a careful comparison of faculty pay at UO with that of our “comparator” institutions, and posted it on the UO AAUP website along with reports from previous years. This is an important step in monitoring the administration’s progress on this issue. The short version, using averages? The Full Professor and Instructor categories are still at 80% of our peers while Associates are at 86%. As mentioned above, Assistant Professor salaries are at 93.6% of the peer average, closest of all the ranks to the level of 100% called for in the 2007- 2008 Update on the Senate Budget Committee White Paper of 1999-2000. So, no real progress on pay. As we reported earlier, there is also no real progress on hiring new faculty to meet the needs of our new students. So where is all the money from tuition increases and new students going? The supporting material to the report is quite interesting, with this plot of the distribution of (full) salaries. They don’t have the full distribution for other schools, so they can’t say whether the pay gap would be different if they used medians instead of means. Their data excludes retired faculty on 600 hours appointments, such as Dave Frohnmayer, whose FTE salary is apparently the highest at UO, slightly over $200,000, plus another $35,000 or so if you count his questionable retroactive summer pay. 4/20/2011: From Sarah Douglas and Marie Vitulli at UO’s AAUP chapter. Also see the AAUP/AFT faulty union website and the Bunsis analysis of UO finances. President Lariviere’s compensation details are here. He is in the top 22nd percentile of public research schools. Don’t get me started on the Chancellor. Stories by Stefan Verbano in the ODE and Bill Graves in the Oregonian – this with many interesting comments. According to OUS data, upper-level administrative costs have risen 63 percent from 2006 to 2010, while instructional expenses have increased by only 22 percent. This seems ballpark from the data I’ve seen. UO’s spending per student FTE compared to Carnegie Public Research university averages, for 2008. This is 2008 – before all of the increases in central administration that Linda Brady and Frances Dyke made kicked in. Yet UO administrators still stick to the claim that UO’s administrative expenses are 38% of our peers. But as for the follow-up argument that Lariviere’s new partnership will make this worse: I disagree. I’m a cynic when it comes to the UO administration. I know this shocks you. Frohnmayer let our administrators give themselves raises while faculty salaries were frozen, and he took every dime he could get for himself as well. But Lariviere – already very well paid himself, so why worry – is telling the administrators that they will not get any more raises until after the faculty does. (With a few exceptions, like Randy, Scott and Michael.) This concentrates their minds wonderfully. On the other hand he does seem to be allowing the administrative bloat bubble to build, in terms of their overall budget share, if not individual salaries. 8/30/2010: for state union employees begins Wednesday. Update: We’ve been told that this increase will only go to those employees not already at the highest step, and that it will barely compensate for the mandatory furlough pay cut, even for those who do get it. I think those economists call this an increase in consumer surplus. This should reduce the pressure to do something about UO’s low faculty pay. Sure, it’s 79% of our comparators, and housing costs are 140% – but we’ve got decent pinot noir for $7.99, and no sales tax. The question is how this will affect grappa prices. Your answer should include figures and a brief explanation. Hint: substitutes or complements in production? In consumption? Does the fact that grappa is typically drunk within the year, not aged in barrels, matter for your results? Despite struggles with years of budget cuts, the University of Florida announced on Friday a broad package of pay raises for faculty members. The 4-percent merit raises buck a national trend of wage freezes at public universities and are possible, university officials said, because Florida tapped federal stimulus money to cut costs through buyouts and retirement payments. For 2009-10, average pay for a full professor at UO was about 12% below Florida. (And no, Provost Bean, we’re not counting UF’s Med School.) Eugene’s housing prices are about 10% above Gainesville’s. 6/8/2010: This is rumor but we hear President Lariviere is still going to push to raise faculty pay. For full prof’s this is the lowest in the AAU by 10% and is currently at 84% of our “peer institutions.” Most of the raises will go to the full’s as a group, they are the most underpaid. In the comments, “Wild and Crazy Duck” thinks this is the wrong time to push for raises. I disagree. The counterargument is that drastic steps are needed to ensure UO’s survival as a top research school, that this should be a top state priority, and that the benefits to the students are worth the extra tuition. I think Lariviere can and will make that case to the public. He’s already got a bunch of newspaper editorial boards to sign on, including the Oregonian and the RG. And I bet that he got the OUS Board to agree to something like this before he accepted the job. So which fulls will get the raises? Lariviere has ditched Russ Tomlin’s plan, which was to give the most money to those making the least relative to their peers, with a small merit bump. The new plan is an across the board increase (still targeted mostly at fulls) in proportion to current salary with the amounts determined by how far the department is behind its comparators. The main difference is that Tomlin’s plan would have given most of the money to those making less than the dept. average, the new plan will give most to those making more. No word yet on OA’s and senior administrators but we can assume the latter are spending a lot of time on figuring out how to get their own raises. In the past UO has used “stipends” to funnel more money to the senior administrators, then folded the stipends into salary later, when no one is looking. For example, Provost Bean got a $12,000 stipend (folded into his salary last year), Diversity VP Martinez gets a $23,306 stipend on top of his regular pay and his off the books OSLC money. These stipends are supposed to go to faculty who take on extra administrative assignments. Too bad! * Note to reader: These stipends are not for expense reimbursements: they are regular taxable income, just from a different pot. 5/10/2010: The local AAUP (American Association of University Professors) chapter sent along these recent data on faculty salaries at UO relative to our “comparator” schools. Obviously we are not comparable. Compensation is 90%, 97%, 93%, and 85%, for instructors, assistants, associates, and fulls, respectively. It’s worse if you look at pay – arguably a better measure: 77%, 91%, 85, 79%. UO senior administrators are paid 120% of their peers. More, if you adjust for size and complexity. UO full professors are paid 81% of their peers. Comparison institutions are all public and private PhD granting institutions from the Chronicle of Higher Ed. This is the comparison group UO uses when setting administrator salaries: no senior UO administrators are paid less than 100% of the median in this peer group. Frohnmayer, Bean and Martinez (even without his second job) account for most of the excess above 100%. Go here for the Chronicle faculty data, here for administrators. UO Provost Jim Bean challenged this conclusion in the UO Senate. He claimed that the comparison faculty salaries we posted included salaries for (very well paid) medical school faculty. They do not. We are making a fair comparison between like groups of non-med school faculty. Bean is comparing UO administrators with no med school to supervise with those with responsibility for medical schools, adding to the bias in his results. Additionally, in Provost Bean’s data and analysis of administrator salaries he compares UO administrators to those at AAU schools which have on average 160% of the students, 370% of the faculty, and 440% of the budget of UO. Provost Bean is a case in point, even using the comparator group he selected himself. As an internal hire – with no experience and in his first year on the job – he is paid 96% of the salary of the average AAU public university provost, who is dealing with an institution that is 4 times as large as UO. 4/19/2010: Rumor control reports that Brad Shelton’s new budget model has already translated into new money for some academic departments for next year, and that Pres Lariviere has developed a 5 year plan to raise UO faculty salaries to the average of UO’s “peer” institutions, with the first round of raises starting in Sept.
Eugene housing prices are 140% of the median college town. The 98th highest out of 117. UO pays senior faculty 83% of the national median salary. The lowest of all AAU schools, by a big margin. One of Lariviere’s first statements to the OUS board after he was hired was that raising UO faculty salaries to the AAU public median was his job number one. It will cost ~ $10 million per year to get us out of last place and another ~$10 million to get us to median. Since that statement he and Bean have piled on a lot of new administrative hiring, while faculty pay is frozen. Why? Some people think it’s because Brad Shelton’s long-delayed budget model will reduce administrative growth, and they are trying to grandfather in everything they can first. We hear rumors that a program to raise faculty salaries is now in the works. It would be more credible if we didn’t see the money going out the door for so many new administrators. 1/29/2010: PERS currently has assets to pay only 75% of liabilities. This Ted Sickinger story reports that the board votes today to raise the pay in rates from 12% to 18% next year all at once or do so so gradually (most likely scenario). Either case will mean a big increase in UO’s payroll costs. Not clear if OUS will raise TIAA contributions as well. Provost Bean’s Senate numbers are wrong: UO’s senior administrators are overpaid. UO senior administrators are paid 120% of their peers. Scroll down for spreadsheets. Comparison institutions are all public and private PhD granting institutions from the Chronicle of Higher Ed. This is the comparison group UO uses when setting administrator salaries: no senior UO administrators are paid less than 100% of the median in this peer goup. Frohnmayer, Bean and Martinez (even without his second job) account for most of the excess above 100%. Go here for the Chronicle faculty data, here for administrators. UO President Frohnmayer needs a spreadsheet of his own, here. At the 5/13/2009 Senate meeting Provost Bean refused to give up on his Furlough meeting claim that UO’s Admin expense ratio was 38% of peers. Odd, because an hour before the meeting one of your Editors was talking with OUS Legal Counsel and Board Secretary Ryan Hagemann, who said that despite extensive searching OUS could find no evidence to support this claim. Mr. Hagemann then said that he would be encouraging Provost Bean to stop making claims of this sort unless he could back them up with data. Bean also tried to argue that UO administrators were underpaid. Confusingly, Provost Bean left his own $25,700 “stipend” – which he takes as straight salary – out of his own reported pay. (more below). At the Senate meeting Bean said that misinformation about UO’s administrative expenses were being spread by blogs. We are happy to hear he is not the only administrator reading UO Matters. His extensive remarks and the data he presented to the Senate are an attempt to provide some sort of documentation for OUS for the claims about UO’s lean administration he made at the Furlough meeting. As we show below the administrative expense data he presented does not support his argument at all. Mr. Hageman also told us that OUS has no documentation supporting Provost Bean’s claim that Bend is in the black, and we are expecting that he will soon be asked to document that as well. We are *very* sure he cannot credibly do this no matter how much the data is massaged – it would take an outright lie. Provost Bean, the best approach at this point would be to retract both these claims and get out of your hole before it gets any deeper. Briefly, Provost Bean’s data and analysis of administrator salaries does not show what he claims, because he compares UO administrators to those at AAU schools which have on average 160% of the students, 370% of the faculty, and 440% of the budget of UO. Of course these universities must pay their administrators more than administrators at UO’s actual comparators are paid. The comparisons we have posted below are better than Provost Bean’s with respect to both the set of comparators and the accuracy of the UO administrator salaries, and we stand by our conclusion: UO’s administrators are overpaid. However, even if you believe Bean’s analysis – which you should not – you would still have to conclude that UO administrators are substantially overpaid relative to UO faculty. Provost Bean is a case in point, even using the comparator group he selected himself. As an internal hire – with no experience and in his first year on the job – he is paid 96% of the salary of the average AAU public university Provost, who is dealing with an institution that is 4 times as large as UO. UO full professors are paid 80% of the average full professor at these same comparators. Why are UO faculty underpaid approximately the same amount regardless of the comparator group? Because the institutional complexities that determine administrator pay are not particularly important – in theory and in the actual salary data – for faculty, whose jobs involves teaching and research, not managing the institution. First Provost Bean claimed that Frohnmayer was paid just slightly more than his peers. But Bean – who has a PhD in Operations Research – departs from the standard Chronicle.com definition by not reporting the $206,000 Frohnmayer receives in 401K and retirement pay. (He also excludes this from his numbers for other AAU presidents – but Frohnmayer’s retirement deal is unusually sweet.) He then tried to argue that years of service explained Frohnmayer’s unusually high salary. In fact the correlation between years of service and presidential pay as Bean defines it, excluding Frohnmayer, is negative (but insig diff from 0). This is not surprising: years of experience would be a more interesting question. Confusingly, Provost Bean left his own $25,700 “stipend” – which he takes as straight salary – out of his own reported pay. (Many UO admins get these stipends. They are left over from former Provost Moseley, who used them to pad admin salaries during the last OUS salary freeze. Some have been folded into salary by now, and only Bean and Martinez currently get substantial amounts of salary this way. Stipends at other institutions typicaly means expense money, not extra salary.) Correcting this apparent oversight, and using the comparator group Bean selected himself, we find as an internal hire with no experience in his first year on the job he is paid 96% of the average AAU public university Provost. As this OUS document shows, the Provosts which Bean thinks are he should be compared to have, roughly, 160% of the students, 370% of the faculty, and 440% of the budget that he and UO’s VPs must deal with. Obviously this comparison is heavily biased toward making UO’s administrators look underpaid. A more precise measure would require access to the CUPA data, which Bean is so far unwilling to share with UO Matters. We expect similar results will hold with this data, and for the other senior administrative positions at UO. While Bean’s comparator group is biased in favor of making UO administrators look underpaid, the UO Matters comparison group is as broad as possible. We assume UO resembles the median PhD granting institution. There are 258 such public and private institutions in the US, and a position of 129 fits closely with UO’s rankings in most published sources. While the source for Bean’s comparisons (CUPA) includes the budget information needed to correct for budget and so on in a regression, Bean cut this data out of his tables. Provost Bean also claimed that the comparison faculty salaries we have posted here include salaries for (very well paid) medical school faculty. They do not. We are making a fair comparison between like groups of faculty. However, his comparison group of administrators does include those with responsibility for medical schools, adding to the bias in favor of himself and his administrators. As we have shown the comparison group does not matter for UO faculty – we are equally underpaid no matter which comparator group you select. So why does our data show UO administrators are overpaid relative to peers while Bean’s show they are underpaid? Because the comparator groups are different. We argue UO is similar to the median Doctoral institution. Bean’s comparator institutions are unarguably larger, richer, and more complex than this or than UO – about than 4 times so, if you go by budget or faculty size. Obviously these universities must pay administrators more than the UO needs to pay. These institutional complexities are not particularly important – in theory and in the data – for determining salary for faculty, whose jobs involves teaching and research and not managing the institution. The Editors of this blog have seen all these tricks and plenty of more clever ones many times before, and we are not amused. The comparisons we have posted here are considerably better than Provost Bean’s with respect to both the set of comparators and the accuracy of the UO salaries, and we stand by our conclusion: UO’s faculty is underpaid relative to peers, and its administrators are overpaid. However, even if you believe Bean’s analysis – which you should not – you would still have to conclude that UO faculty are substantially underpaid relative to UO administrators, while UO administrators are overpaid relative to UO faculty. UO data is compiled from public records obtained from UO, generally only after lengthy delays and petitions to the Oregon DOJ – however all these records are public records posted with the knowledge of UO’s General Counsel Melinda Grier. In response to a request from a curious Johnson Hall dweller, I’ve also posted all the employment contracts I have, see the underlined links. This post is not peer-reviewed: If you have questions or see errors, please email uomatters at gmail dot com. This UO Senate report documents these and other trends over time. CUPA data from Bean’s Senate report and other sources – he has not yet agreed to share the full data. Starting in January 2010 PEBB will “self insure” our health insurance with Providence as the plan administrator. Providence is a regional company headquartered in Washington state and owned by the Sisters of Providence, a Catholic order. Providence sets up provider network and handles all claims. PEBB designs the plan, pays the claims and assumes all the risks that Blue Cross assumed in the past. PEBB says there will no change in our insurance but there are many indications that this will not be the case. This is likely to be a huge change in total compensation for UO faculty. When you think of how seriously people take changes in pay of a few %, it’s amazing – or perhaps entirely unsurprising – there hasn’t been more open discussion of this and more info coming from Provost Bean. 6/15/2009: The RG has an editorial today on low faculty salaries at UO – repeating the now infamous $7,300 less than Missouri number, and making enough other comparisons to head off the counter-arguments and excuses we’ve been hearing from President Frohnmayer and UO’s administrators on this. The RG then argues – or maybe this is my explication – that the current high unemployment rate shows that the state should diversify its economic base, that higher education is a proven way to do that, and that low faculty salaries are not going to make it easy to build UO back into the strong research university the state needs. As always the question is how to come up with the money to do this. It will take about $10 million per year to get salaries up near peer levels. UO has this money already – thanks to higher tuition and enrollment. This site tries to document how the current administration has been spending that money on their own salaries (120% of peers), perks ($3 million on remodeling!) and a raft of pet projects that distract from our core academic mission. If incoming President Lariviere is serious about rebuilding UO, he is going to have to start by making some tough decisions about the millions of dollars that UO has been spending on increased administrative salaries and expenses, subsidizing Bend, new programs in Portland, diversity, sustainability and so on. Tough choices. The sooner he starts, the sooner the rebuilding will start. I hope that editorials like this will make Lariviere’s decisions on these issues easier. They will be opposed by many special interests, including President Frohnmayer. Unfortunately Frohnmayer has chosen to forego the traditional year long off campus sabbatical for retiring presidents. The reason for this tradition is to ensure that the old president will not meddle in the decisions of the new one. It is a bad sign that Frohnmayer did not do this voluntarily, and a worse one that Lariviere did not have enough influence with the OUS board to insist on it. 6/11/2009: One thing that will inevitably come up when discussing the fact that UO’s pay is last in the AAU and 10% below that of Missouri is benefits. Administrators claim that UO’s benefits are better than average. What they really mean is that UO pays more for benefits than other places do – very different from having better benefits! In particular, looking at costs does not account for things like regional differences in health costs, or more generous but not fully funded (hence cheaper) retirement programs at other schools. We’re not aware of any study that makes an accurate comparison. Also keep in mind UO’s retirement program is now much less generous than it was (although more expensive) and that cuts in health benefits are on the way. Administrators will also argue that Eugene has low housing costs. Maybe back when they bought in, but Eugene is no longer a cheap place to live. A reader just alerted to me to a good table that includes pay and pay+benefits, posted by the AFT/AAUP Union people, using the same data as the Maneater article. Personally I think the AAU comparisons are not justified: we are not in that league anymore. But if we use all PhD granting the basic result that UO full profs get 81% of peers while UO senior administrators 120% is depressingly robust and controls for all these factors. How did we get to this situation? Easy: For the past 15 years President Frohnmayer has been in charge. He determines how to allocate money between instruction and administration. He is not an academic and he could not have cared less about our ability to hire and keep the top faculty needed get UO back to Carnegie VHR status. But he was willing to pay top dollar for sycophant administrators and a raft of inane pet projects. We hope Lariviere does care and if he doesn’t prove it right away UO needs a union.